Like many people I’ve been paying more attention to prices at the grocery store and to what’s on sale. So when I noticed a row of organic chocolate bars on sale at Rainbow Market, I decided to go for that instead of the pricier choice. Never mind that the best choice all around would have been: no chocolate. Standing at the checkout line, I looked at my selection. 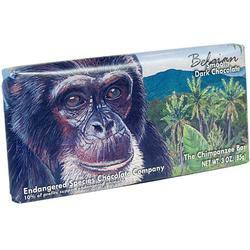 It was Endangered Species Chocolate: specifically, the bar with the Endangered Belgian Chimpanzee on it. Or maybe it was just the chocolate that was Belgian. I wondered why I had never tried it before. Even now, about to buy it on account of the dollar discount, it just wasn’t…. appetizing. I care about endangered species. I appreciate that this company donates 10% of their profits to wildlife conservation. I will even generally pay a little more to support fair trade imports. So why my resistance to this product? the more usual scenario, showing us an appetizing or stylized vision of what we’re about to eat. the more visceral strategy of luring us with a picture of some celebrity or model — and the implied promise that by eating this food, we will become more like they are. I think this is related to some mythic impulse to ingest our deities and heroes — without the mess of actually eating, say, Lance Armstrong. There may be other categories, like the cartoon monsters on cereal boxes that little kids eat, but anyway — the point is, when I’m craving chocolate, I’m rarely also in the mood to either eat or become an endangered chimpanzee. “The chimpanzee isn’t in the chocolate, silly,” my friend said as we sat outside finishing our lunch and eying desert. She had bought fruit. “What you’re eating is your paycheck,” she pointed out. She did not argue with this logic. But it reminded me of something even more remarkable. Chocolate used to be money. I told her about the presentation on sustainable economics at the Green Festival. The speaker was Daniel Pinchbeck and he was talking about Ithaca Hours, a local currency in Ithaca NY which encourages people to spend their earnings within their community. Afterwards someone asked what happens when this currency pools — when one business is stuck holding alot of the Ithaca dollars but needs to pay suppliers that don’t participate in the program. After looking at different mechanisms for dealing with this scenario, Pinchbeck took a longer view of the issue. Our current economic system encourages investments that will yield the highest short-term return regardless of the long-term consequences. But what if we could measure and reward investments according their ability to sustain community? Currency only has value as long as it’s in play. Pinchbeck mentioned the work of Bernard Lietaer, architect of the Euro, and alternative systems that Lietaer had proposed including currency that would depreciate over time — a kind of negative interest. The Ancient Aztecs, Pinchbeck noted, traded in cocoa beans. The actual unit of currency decayed over time and lost value. The point was to spend and trade wisely, not hoard the wealth. With this in mind, I let go of any impulse I might have had to hold onto that chocolate bar with the picture of the chimp on it, to use it as a hedge against an uncertain future. I broke off a small piece for my friend, and before we knew it, the whole thing was gone. Great post, excellent material. I have to agree at just about any discount I think I’d pass on the Monkey Bar and just visit Big Lots. For Ithaca Hours, you have brought up a common situation, if there is no exchange for the community currency from USD to CC and back again, bottlenecks appear. No matter how great the explanation, this is a serious issue and causes business to only accept partial payment in CC or stop accepting when they have acquired some level of script. I believe the Berkshares.org have it correct, there is an open and lively exchange from national currency to CC anytime through their local credit unions. Merchants can accept CC for the full price of items and never be caught with ‘too much’ local stuff. Their currency circulates on average through 4 different users before it is converted back to USD. Have you ever read Kim Stanley Robinson’s Mars series? It imagines, very interestingly I think, a complex amalgam of the gift economy, nitrogen credits, and money. If you like the scifi, I recommend it. thanks for the good word and the recommendation. I haven’t heard of Kim Robinson but I’ll keep an eye out. First I think cartoon monsters do qualify as deities. The poet Gary Snyder once commented how dismayed he was to see his kids, who he was raising in a cabin homestead in the Sierras, playing “log truck” with some blocks. That is until he realized that kids just emulate the most powerful thing in their environment. Now back to money. I worked with Lietaer on a carbon credit project a few years back and find him incredibly intelligent — so intelligent I can’t actually repeat anything he said. But I do remember him talking about creating an asset-backed currency created by corporations and standardized to their inventory of goods. His claim is that a backed currency that has real value becomes inflation proof. The non-asset backed currency of today hinges on people’s faith in the government and their faith that they will be able to spend that currency. So, by advocating for alternative currency are you creating a better currency or being a detriment to the current one? If you begin convincing people that there are better currency systems are you solving the problem of inflation or causing it? Better to the degree that it’s local and based on community ties. I don’t think this kind of alternative threatens other systems. But it might provide a more sustainable backup than, say, hoarding lots of gold to trade for food. What’s more valuable: arbitrary value (gold, dollar, yen) or knowing the farmer who will give you some food, or even better, having a garden and the skills to cultivate it. Devil’s advocates always welcome here!